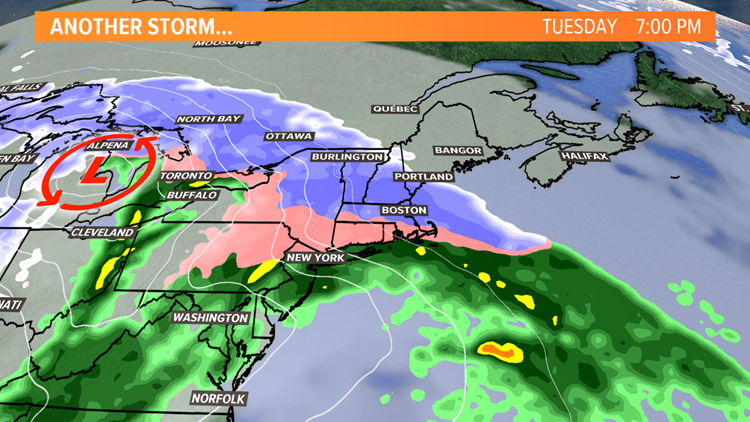 Another midweek storm is on the way and it will deliver a solid snow thump Tuesday night into Wednesday. It's been tough to get a pure snowstorm this season and that trend won't change with our next one poised to move in Tuesday evening. Low pressure will eject out of the lower Mississippi Valley tomorrow and travel into the Great Lakes. A cold dome of high pressure will lock cold air in the Northeast forcing the low to redevelop off the New England coastline. 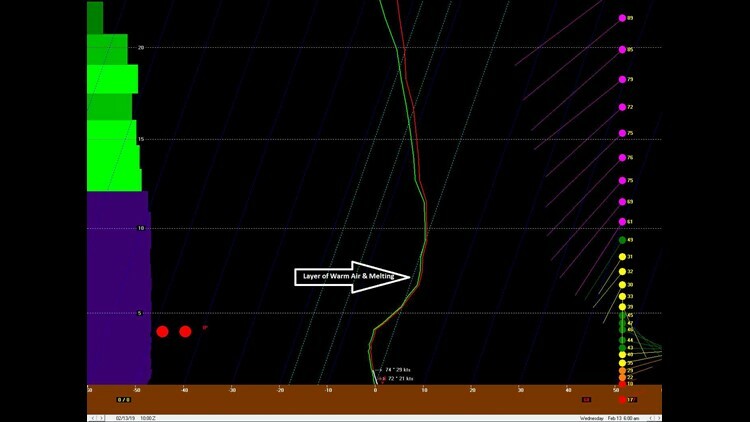 Snow will breakout tomorrow evening after most of you get home from work. But York County may get a little slippery with snow arriving between 4-6 PM. Snow will overspread the State from West to East through the evening, getting to Bangor around midnight. The snow will be steady and heavy at times through the night. 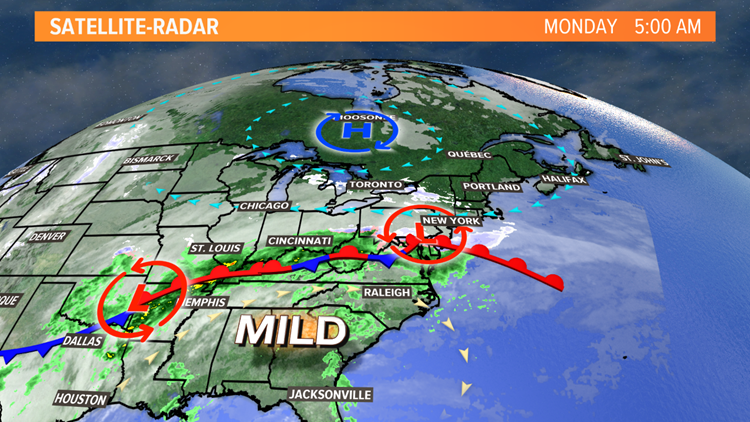 The new low will form to our South and move into the Gulf of Maine during the pre-dawn hours. The track is currently expected to travel right along the coast and then into Downeast Maine. Just like so many other storms this season, keeping the precipitation all snow will be very tough. 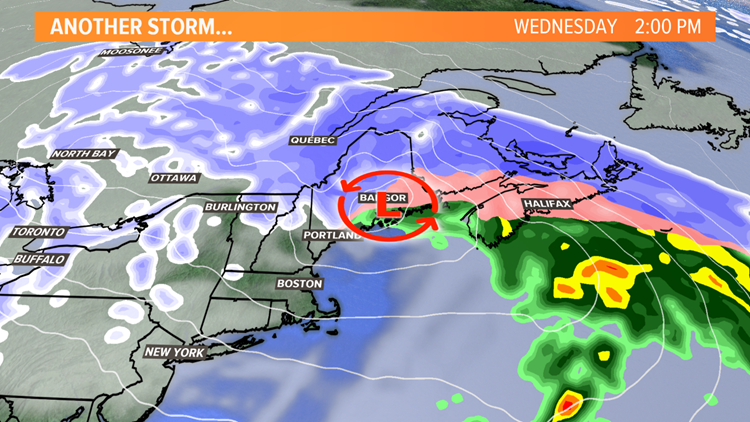 A wedge of mild air is expected to poke into the coastline Wednesday morning changing snow to sleet and maybe even a little rain. 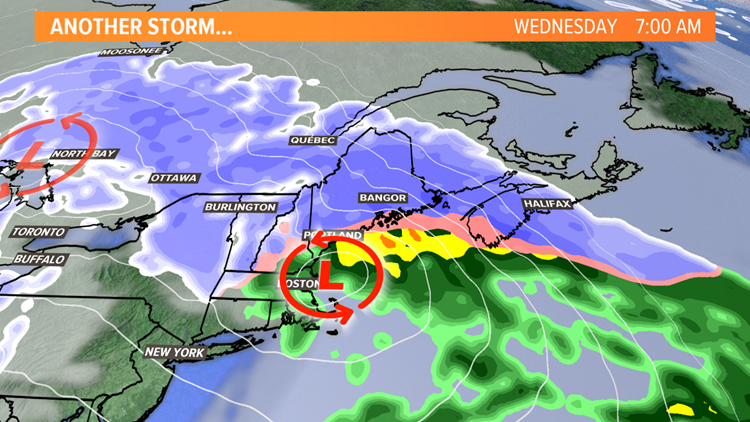 The mixing may get as far inland as Lewiston, Augusta and Bangor. Regardless of mixing, Wednesday morning is going to be a mess. I expect a lot of school delays and cancellations. The storm will slow as it moves up the coast and into the Maritimes. This will delay the ending until midday across Western Maine and the afternoon for Eastern Maine. At this point, I'd say count on getting 6" before any mixing would occur. If the mixing is delayed, there may be as much as 10". 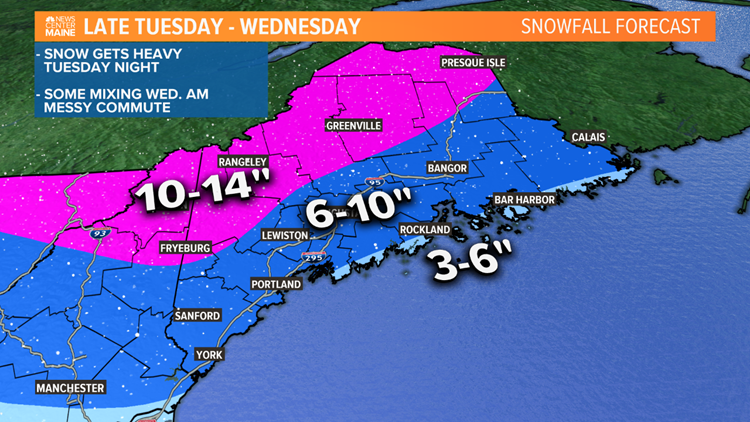 A few communities, peninsulas and islands along the Mid and Downeast Coasts will get a little less than 6". The mountains get whacked with a solid foot of pow. These numbers may adjust slightly so continue to follow the forecast through tomorrow leading up to the storm.